I have been a Neuroscience Ambassador for a little bit over a year now, and it has a great experience that has taught me so much and introduced me to so many amazing people. As a Neuroscience Ambassador, it is my responsibility, along with my fellow ambassadors, to represent the Neuroscience program at OSU. From working orientations, to events throughout the school year, to open houses, I am always available to to the new Neuroscience majors to answer any questions and to act as a mentor to guide them through their first year. Working as an ambassador is great because we get to make lasting relationships as we talk to some of the same students at each event. For example, the picture below shows me and a couple of my fellow ambassadors with a group of freshmen. We ended up making a group chat for the freshmen to ask us any questions they had throughout the year, which I hope was a helpful tool for them. At orientations, we helped each freshmen schedule their first semester of classes. At open houses, we talked to prospective students about the major and about OSU as a whole. 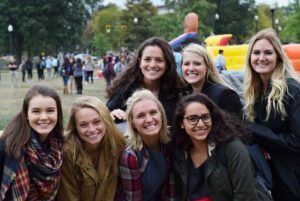 Lastly, at events throughout the year such as the Pancake Break in fall Semester and various picnics on the oval we talked to the new majors and checked in to make sure everything was going okay for them in their first year. Being a Neuroscience Ambassador has given me so many great opportunities and connected me to some incredible people and I look forward to seeing what it brings in the future. Posted by Mackenzie King at 2:10pm Posted in G.O.A.L.S., Leadership Development. Bookmark the permalink.